You. Generally, when you look in the mirror it's ''you'' who looks back. A ten-book 90s series by author Chris Archer. In the sleepy town of Metier, Wisconsin (French pronunciation: MEET-e-AY), strange things are happening. Last year, Todd Aldridge disappeared when wandering near the reservoir (formed by a meteor impact) the night of his thirteenth birthday. Some people swear they saw strange lights in the sky. Now, in rapid succession, five kids (each missing one parent who all vanished on the same night) turn thirteen, discover superpowers, their blood turns a silvery color and a shapeshifting alien shows up to capture or kill them. As the series progresses, the kids organize and fight back. They even find Todd. Alien Abduction: Todd Aldridge, before the series even begins. Alien Among Us: The kids believe themselves to be human-alien hybrids. Alien Blood: Literally, with the kids' silver blood. This is also the title of the second book, where that fact is discovered. Astral Projection: Elena can do this. Bad Future: The entirety of book seven takes place in one of these, and escaping to the past is the first obstacle in the next book. Bizarre Alien Biology: Silver blood. Cerebus Syndrome: Zig-zagged. The first books set up a formula of a kid fleeing an unstoppable alien assassin. The aliens grew less threatening as the books went on, and the kids gain agency in fighting back, but they also deal with preventing the Apocalypse. Does This Remind You of Anything? : Six kids fighting a secret alien invasion, in which shapeshifting plays a prominent role. Dreaming of Things to Come: One of Elena's main powers. Everything's Even Worse with Sharks: One alien turns into a shark-monster to pursue Ashley into the water. Faking the Dead: The night Ashley gets her powers in Alien Blood, she falls through the ice on the reservoir. Later, she tries to hide underwater there, and the alien goes away after finding her corpse. It seems her regeneration kicked in that night and saved half of her. Fire-Forged Friends: The six teen heroes. The end of the book is them all promising that whether or not they still have powers, they will always be close friends. First-Person Perspective: All of the books, really. Gone Horribly Right: The Omegas. After the first batch of supersoldiers failed because the subjects bonded, refused to kill and rebel, the military strived in the next group to remove the 'humane element' mercy, compassion and the ability to form human connections and loyalties. It worked. Heart Is an Awesome Power: Jack is initially distressed that his friends get cool powers, and he can order meals at a Taco Bell. His powers save his life in the same book, however, because he can read codes, speak to a fax, and even direct ants to chew through ropes. Heroic Sacrifice: Elena and the fake Todd each sacrifice themselves to alien captivity to give the others a chance to escape. Innate Nightvision: One of Ethan's powers, crucial to surviving his final fight in the first book. Instant Expert: Ethan knows kung-fu. His instant, instinctual mastery of martial arts is the first hint in the series that something really weird is going on. Mundane Utility: Everyone, to a greater or lesser degree, finds a way to use their powers to make life easier. Jack wins money on a TV show showcasing 'weirdities' and makes a fool of his Spanish teacher. It gets pointed out to Todd that school will become amazingly easy, since he can memorize things whether or not he's paying attention, but he's never shown to use it. People Jars: Everyone captured by the aliens gets stuck in one. Poisonous Person: In the first book Ethan is attacked, and lures the alien into a dark corridor so his nightvision will give him an advantage. When that doesn't work, in desperation he bites the alien. Turns out he's venomous. Later, he tells people this man attacked him from nowhere before dying of a heart attack. Psychic Powers: Elena's whole shtick, and she believed in them long before she had them. Psychometry: Elena's book begins with her trying to find Todd by performing psychometry with his camera. It works, sort of. Reverse Cerebus Syndrome: The series starts with a distinctly horror vibe, children stalked by mysterious, nigh-unstoppable attackers. While frightening things continue to happen, as the series progresses the kids gain more understanding of their enemies, and more agency, heralding a shift away from horror as they fight back effectively. Riddle Me This: In the second book, after several strange things have happened around Ashley, she finds a note in her locker assuring her that's not going crazy, and she really is in terrible danger, ending with the phrase 'if you set aside the why, you can find me in a year.' At first she thinks of all the people she's met or heard of named after a month, it's only later, after seeing a line of high scores in an arcade, that she realizes it was Ethan who left the note. Set aside the 'y' and find his initials, EAR. It's unclear why, or if, he thought she could solve that riddle, and why sign the note at all if he wouldn't do so openly. But it was very nice to see the hero of the first book again. Self-Duplication: Happens to Ashley twice, once on purpose, when she's cut in half and each part grows into a complete person. Shockand Awe: Toni's power to absorb electricity and expel it. Speaks Fluent Animal: Jack can do this, but only does so once, getting ants to chew through ropes binding his hands. Super Soldier: Ethan, who often says it's like he was designed to be the perfect warrior. He was. As were all the kids, their parents and the 'aliens' chasing them. Time Travel: Plays a major role in the series from book six on, with the final member of the team having a time-travel power. 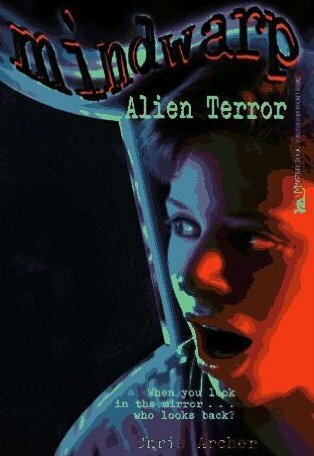 Tomato in the Mirror: In the fifth book, Shapeshifter, Todd Aldridge returns to Metier he's actually one of the aliens, programmed to believe himself Todd to infiltrate and capture the kids. But his programming takes and he sacrifices himself to let them escape. Later he helps them again. Tone Shift: From mostly horror to adventure. Toni's (time) powers first trigger when trying on a dress, looking at herself in a changing room mirror. She travels back in time eight years for a little while, then returns to the present outside the store, and gets busted for shoplifting. Later at home, she tries the dress on again and goes back in time eight years to when she was five and her mother was still alive. After speaking together, the mom calls in five-year-old Toni and implants a hypnotic command to come back to this day when seeing 13-year-old Toni in that dress. Later, she uses her mugshot from her shoplifting arrest to escape a jam, not having learned how to time-travel on purpose yet. Todd's father also implanted a recorded message in him, to explain to all the kids what was going on if they should ever gather, it also taught him how to use his powers so he didn't have to go through a book's worth of self-discovery like the others. Voluntary Shapeshifting: The villains' signature trick.